Synopsis: It is a dark and stormy night at Midland University, and Dr. Julian Blair (Boris Karloff) is demonstrating a breakthrough discovery to his colleagues. He has found that human brains emit electromagnetic wave-patterns, each as unique to an individual as fingerprints. Blair has found a way to measure and record these waves. Furthermore, he has learned the wave-pattern of women is much stronger than that of men. 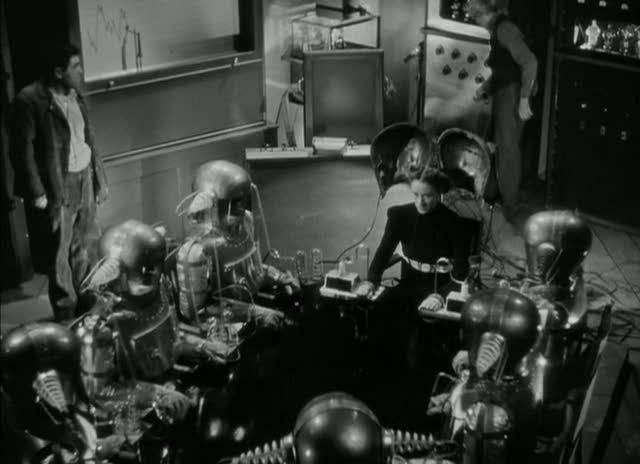 To demonstrate this last point he wires his wife Helen up to his electroencephalogram, which features a big diving-helmet type contraption that goes over the head. As the scientists watch, they see the needle on the device recording a steady pattern of peaks and valleys, interspersed with small jigs and jags in the needle. These small variations, Blair says, are individual thoughts, and in time he will be able to decode them. Blair's colleagues shower him with congratulations on his discovery. Helen reminds him that they must pick up the cake for their daughter's homecoming, and Blair, ever the doting husband, hurries to close out his demonstration -- forgetting to shut off the inputs for the machine. Blair and his wife drive to the bakery to pick up the cake, and we get a strong impression that the two are happy and very much in love. Unfortunately, in the movies this can only mean one thing, and sure enough, Helen is killed minutes later in a car crash. Despondent, Blair gets through the funeral, then returns to the lab, hoping to find solace in his work. To his astonishment, he finds that Helen's unique brain-wave pattern records for a few moments on the machine, which had been left on. Blair tells his colleagues of this incident, and that he might have stumbled on a means of communicating with the dead. But the colleagues are not only skeptical, but embarrassed that he would entertain such a notion. Blair is angry at their willful stupidity. The building's maintenance man, Karl, overhears their exchange, and he later tells Dr. Blair that he knows a psychic who can communicate with the dead -- she is, in fact, helping Karl communicate with his dead mother. Blair is doubtful, but he accompanies Karl to a seance. The psychic, Blanche Walters (Anne Revere), once again helps Karl receive a message from his dead mother, but after the seance Blair exposes her as a fraud. Nevertheless she agrees to assist him his experiments when he offers to compensate her. Blair's idea is to use Mrs. Walters' naturally stronger wave-pattern to establish a link with Helen. When this fails, he decides to add Karl to the circuit, like an amplifying grid in a vacuum tube. Alas, poor Karl! An electric charge fries his brain, making him like a shuffling zombie. Knowing that medical treatment for Karl would lead to questions, and the end to the experiments, Mrs. Walters convinces Blair that they need to immediately decamp to a new location. Soon enough, they have set up shop in a spooky house outside the small town of Barsham Harbor. Comments:There's only one thing worse than betraying your principles to get what you want. And that, of course, is betraying your principles to get what you want and not getting it. 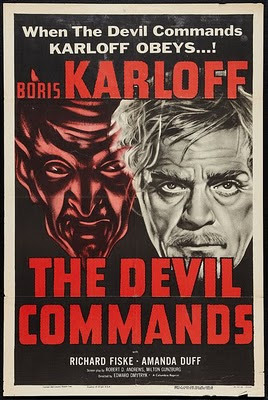 That's Boris Karloff's fate in The Devil Commands, a clever little film that unfolds with a deliberately ominous pace. I know, I know. I've complained about these Columbia mad-scientist pictures starring Boris Karloff. And I've suggested that there must have been a crazed producer behind them, a cinematic mad scientist skulking around the studio lot, trying to formulate the perfect Boris Karloff vehicle. On the surface, this one looks like those earlier, flawed efforts. We've got a convoluted science-fiction premise, a philanthropic scientist, a tragic death and an angry abandonment of society. But not only does The Devil Commands work, it's one of the best movies we've seen on Horror Incorporated so far. Now, how could that be true? 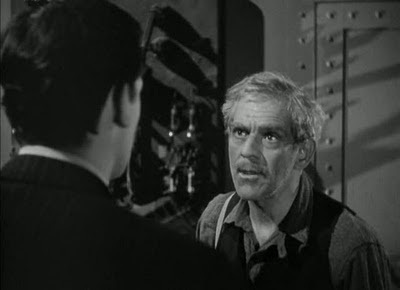 First, Karloff never entirely loses our sympathy in this picture. Julian Blair doesn't suddenly decide, like Dr. Savaard in The Man They Could Not Hang, that the world has given him a lousy break and he's going to get his revenge. Nor does he decide, as Dr. Kravaal did in The Man With Nine Lives, that his experiments were just more important than the pesky lives of his small-minded neighbors. Rather, Blair's judgement is occluded by his love for his wife and the tantalizing possibility that he might be reunited with her. The way he is drawn into this trap is quite plausible; he witnesses her electroencephalogram tracing its way across the paper after she is dead, and though he tries desperately to repeat the experiment, it always seems just out of reach. Each subsequent attempt to increase the psychic energy to pull in Helen's "signal" from beyond the grave ends in disaster: first Karl's near-fatal electrocution, then the grave-robbing in Barsham Harbor, then the murder of Mrs. Marcy. And whenever the good Dr. Blair begins to question the morality of his own actions, he is brought to heel not by a titanic ego or a deranged need to prove his theories, but by the steady and calming influence of Mrs. Walters, table-tipping fake turned parapsychologist. Played by Anne Revere, Mrs. Walters might have simply served as a cut-rate Lady Macbeth. Instead she becomes the most intriguing character in the film. Though she is angered and humiliated when Blair exposes her as a fake, we also get the impression that once -- long ago -- she believed all her prattle about the spirit world. In Blair she sees a chance to redeem the life she wasted bilking the credulous, sees a means of restoring her shattered faith and fractured dignity. No wonder her need to press on with the experiments never wavers, even when Blair's does. And no wonder that when Mrs. Marcy stumbles into the lab, she finds the corpses gathered around a table, hands outstretched, as though they were at one of Walter's own seances. Blair thinks he has discovered the scientific basis of the spiritual world, but Mrs. Walters knows better: he has discovered the spiritual basis of the scientific world. Anne Revere was a Broadway veteran who would win an Oscar for her role as Elizabeth Taylor's mother in National Velvet (1945), but her film career was all but ended in 1951 by the Hollywood blacklist. She later won the Tony award for Toys In the Attic (1960). SON OF SHOCK Columbia entry, fourth in Karloff's 5 picture deal (all now covered on this site), and the last movie he made before fleeing to Broadway for the next three years. 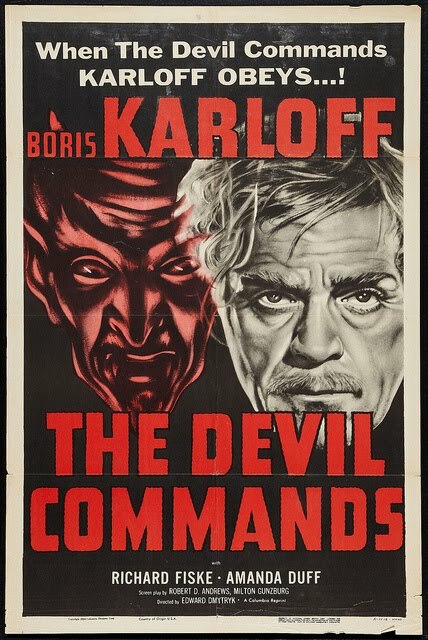 This essentially marked the close of Boris Karloff's 10 year reign as Hollywood's undisputed king of terror, where each separate title was tailored for his talent in eliciting sympathy for every monster Jack P. Pierce helped him create (The Gentle Monster indeed). Top billed 25 times since 1932's THE OLD DARK HOUSE, in this film the viewer again roots for Karloff, his mad scientist crazed with grief, the kind that Lugosi would soon be playing at Monogram. THE DEVIL COMMANDS aired on CHILLER THEATER only once, September 2 1967, paired with WAR OF THE COLOSSAL BEAST.